Yesterday Asus outed the Zenfone 5 and 5z, identical smartphones on the outside that borrow heavily from the iPhone X in the looks department. But if you want a screen notch on a handset running Android, you will soon have another option: the upcoming vivo V9. This too comes with the polarizing feature, as the images below attest. 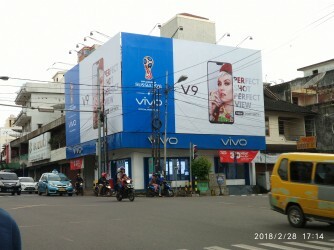 They were captured by a reader of ours and they show the vivo store (and the billboard right above it) in Pangkal Pinang City, Bangka Island, Indonesia. Besides the slim overall bezels of the phone, it reveals that you should expect a 24 MP selfie snapper to be featured inside that notch. 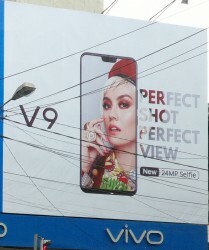 The image on the screen is of Agnez Mo, an Indonesian singer, songwriter, and actress who is vivo's brand ambassador for the V series in the country. No other details about the vivo V9 are known yet, there's been a strange lack of leaks regarding it. Still, since it's already advertised by its maker in at least one market, we assume the official unveiling should happen sooner, rather than later. Thanks for the tip and the images, Brown Duck! Notch everywhere. By the way, I saw that billboard just now.